NEW YORK, New York, May 15, 2008 – Through the lens of a true dialogue amongst three ordinary people, the conversational new book Humanity At Stake: On why the world should now end China’s military & political aggression, understand Taiwan’s democracy, and defend 23 million citizens’ human right to self-determination exposes the issues at hand in China-Taiwan-world relations. China’s Olympic rise and the Chinese Communist Party’s management of human rights issues have come to the forefront of the world’s media, and Humanity At Stake’s dissection of Taiwan and China’s complicated past and present relationship brings light to this timely discussion. 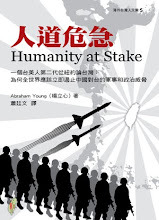 In the tradition of American pamphleteers, Abraham Young’s work takes the message against China’s 1,400-plus missiles aimed at the island-democracy, directly to the American people as part of a national/global campaign of awareness and advocacy. The writer in his 20’s is from the newest generation of upcoming authors. He addresses the issue in an angle unique among grass-roots advocates, Asian-American communities, foreign-policy scholars, political leaders, and human rights watchers. This book’s advocacy effort has already sparked discussion from many communities and leaders, such as Member of Congress Ileana Ros-Lehtinen, whose letter of support is included in the book’s appendix. Readers of all stripes are bridged around this book in common understanding: while Dr. June Teufel Dreyer—author and former commissioner of the U.S. Economic and Security Review Commission—calls the book “A poignant tale, told in a charmingly human voice,” and Shih-Meng Chen—former Secretary General of Taiwan’s Presidential Office—testifies that “This insightful young writer has captured…so many of the dilemmas that Taiwan has faced in its modern history”; community organizer Dr. HoChie Tsai calls the book, "a wonderful starting point to introduce the facts and issues and to initiate further dialogue in an interesting and entertaining way," and Maurice Prize for Fiction winner, Shawna Yang Ryan notes that “Humanity at Stake is a must-read for anyone concerned about peace and democracy in Asia." Humanity At Stake is available on May 19th for purchase online through links from www.HumanityAtStake.com and through Amazon. ISBN: 978-1438214115. $1 from the purchase of each book goes to the non-profit organization, Human Rights Watch. Abraham Young, while at Brown University, was selected for the Capstone Program in Creative Writing for Fiction and worked under the mentorship of novelist Meredith Steinbach. He is also a poet and a blogger. He was formerly an editorial assistant at Penguin Group, and has spent time as an advocate in Washington, D.C., discussing and debating the Taiwan-China-US issue with members of Congress. He lives in New York City.